In 2017, the Village celebrated the 25th year of the founding of the Los Ranchos Growers’ Market. The Los Ranchos Growers' Market is one of the largest in the state based on the average number of vendors per market. The Los Ranchos Growers' Market has an average of nearly 50 vendors each week. (This number does not include the arts and crafts vendors.) The Los Ranchos Growers' Market supports not only the large-scale farmer but also the small-scale backyard grower. The Market limits the number of reserve spaces, as well as the number of specialty vendors (processed food products, meats, cheeses, agriculture related products, etc.) so that they will have space available weekly for those with seasonal produce who want to come occasionally. Our season is one of the longest, from May through mid-November (28 - 29 weeks). We have over 120 different vendors participating, with a high of 60+. The arts and crafts vendors range from 20 to 30 vendors per market. The arts and crafts are a separate market, established years ago when there were (and still are) more artisans than could be accommodated in a Growers' Market, according to the state guidelines. At the height of the season, the growers’ market can have over 85 different vendors at a single Saturday Market. Depending upon the year, between the regular and winter seasons, there are over 30 Saturdays per year that growers, artisans and local businesses are on display. Since 2003, the Growers’ Market has grown from approximately 6000 visitors to nearly 30,000 attendees during the season. Additionally, the Growers’ Market is much more than just fruits and vegetables. Each week there is a local musician, and on any given Saturday there will be special events from guest chefs to “ask the experts”, to specialized events such as Old Vehicle Day, Canine Celebration, Sustainability/Solar, Costume Day, plus special local business “spotlights”, and much more. The Los Ranchos Growers' Market is not only a people friendly place, but also pet friendly. Pets range from cats and dogs to parrots and alpacas. Everyone is required to have his or her pet on a leash. For more information about what is happening at the next Market, click here. For more information about the next Lavender in the Village Festival, click here. The Unser Racing Museum is a multi-dimensional museum experience utilizing modern technologies to educate and immerse the visitor in the exciting world of racing. Take a guided tour and learn about the Unser family history, then explore on your own, seeing and interacting with racing history as it happened. The museum spans the early days of racing from Pikes Peak and Indianapolis to the latest technology, including a racing simulator that puts you in the driver's seat, and interactive kiosks for young and old to learn more about racing in a fun, educational environment. The museum has been expanded to include an all new annex, with even more racing history, cars, and memorabilia. The annex contains a wide variety of cars, from fully restored antiques, to winning pace cars and race cars. There's also a trophy room filled with thousands of unique items, a complete library spanning the history of racing, original artwork, and so much more! There's something for everyone, including a gift shop with hundreds of items, so you can bring home the perfect gift to remember your experience by, or surprise a race fan with a one-of-kind piece of racing history, or immortalize them forever in the museum brickyard. Visit the Unser Racing Museum at the Unser Discovery Campus located in Los Ranchos at 1776 Montano Road NW, call (505) 341-1776, or visit them online at www.unserracingmuseum.com. Set among 25 acres of lavender fields, enormous cottonwood trees and lush formal gardens, Los Poblanos is one of the most magnificent historic properties in the Southwest. Designed in 1932 by the region’s foremost architect, John Gaw Meem, the “Father of Santa Fe Style”, Los Poblanos combines 20 guest rooms, a working organic farm and the ideal setting for meetings and special events. The natural beauty, comfort and privacy of Los Poblanos offer their guests a truly relaxing environment. The area's fertile agricultural lands have seen wheat, corn, chili and grapes in production for hundreds of years – now lavender! Los Poblanos planted its first lavender in 1999 on land that was the headquarters for the historic Los Poblanos Ranch. They offer lectures, festivals and information on growing, cooking and decorating with lavender. You can also visit their Farm Shop for unique products from their lavender fields. If you are interested in volunteering at their farm, working in their gardens, touring the property, dining in their restaurant, or relaxing in one of their guest rooms, go to www.lospoblanos.com or call them at (505) 344-9297. You may also visit them at 4803 Rio Grande Boulevard NW, Los Ranchos, NM 87107. Shopping may be a favorite vacation pastime, but there's no reason to limit it to outlet malls and souvenir shops. If you venture beyond the obvious places, you'll find something unique. Everybody has a little bit of the treasure hunter in them and Los Ranchos is saturated with some of the best antique shops in the state. Check out the stores in Los Ranchos, up and down Fourth Street, and find your collectibles or special antique items. Casa Rondeña Winery was lovingly established in late 1995 as a family undertaking, with the first plantings in 1990 at the hands of vintner John Calvin and his two young sons, Ross and Clayton. The Tasting Room opened in August 1997 and a winery building, with a commemorative Tricentennial bell tower (picture right), was completed in the autumn of 2004. In 2008, a new barrel aging and storage facility, including the Founder’s Rotunda, was built in order to expand production capability of the winery and hold special events for winery members and special guests. In 2010, Mr. & Mrs. Calvin moved out of the home they built on the property and turned it into the 1629 Club. This is a new level of membership to the winery which includes access to the private club among many other benefits. Since 1990, John Calvin has dedicated himself to making New Mexico's best red wines. Mr. Calvin was named Best Vintner by the readers of Albuquerque the Magazine in December 2011 and January 2012. He has become a pioneer of premium wine making in New Mexico, increasing the popularity and knowledge of high desert wines, turning heads and winning medals at competitions from California to New York. His Meritage Red, a Bordeaux style blend of Merlot, Cabernet Franc and Cabernet Sauvignon, has received 11 gold and double-gold medals over the last 3 years. Mr. Calvin's white wines have gained significant respect as well. His estate bottled Riesling blends have won Best of Show for the New Mexico State Wine Competition for two consecutive years as well as his 2005 Cabernet Sauvignon Founder’s Reserve. Everyday at Casa Rondeña Winery, he continues to search for the best expression of the landscape and what it can produce. A native of the Rio Grande Valley, Mr. Calvin's passion for world music led him to study the classical music of India and the Flamenco of Southern Spain. It was there that he began to form the philosophy that wine, in addition to music and architecture, is another way to experience the beauty around us and to coax the diverse elements of nature and earth into a graceful fabric. With this philosophy in mind, Mr. Calvin tends the vines and his wine making with the same degree of respect and passion as his practices of music and architecture. A lifelong student of these disciplines, it is Mr. Calvin's fondest hope that Casa Rondeña Winery will continue to be a center of gravity for culture in New Mexico that will include music, art, architecture, wine and philanthropy. The most important addition to the winery since its beginning in 1995 is Christina Viggiano, Mr. Calvin's wife, whom he married in 2004. Her life in Italy and Italian heritage have brought a fresh passion, beauty and grace to the winery that is reflected in the wines and the grounds alike. For information about their tasting room, the wine club, the wine shop, events and weddings, visit them at 733 Chavez Road NW, call (505) 344-5911, or visit them online at www.casarondena.com. Her beautiful ceramic pieces are truly one-of-a-kind. Each piece designed by Kelly Jo Kuchar carries the signature mark of Kelly Jo Designs, Inc.® (Kelly Jo's initials, a New Mexico symbol and the initials of the Kelly Jo Designs' production artist who painted each individual product). All pieces are crafted entirely by hand in their production studios in Los Ranchos , New Mexico. The artistic renderings on each piece are timeless and showcase Kelly Jo's unique interpretation of varying themes. Rooted in the styles of the American Southwest, her bold and colorfully striking art captures elements of the food, the culture and the landscape that characterize this beautiful part of the country. Visit the studio at 6829 Fourth Street NW, call (505) 341-2737, or visit online at www.kellyjodesigns.com. Flash back to the long gone days of the Prohibition Era. Often cloaked behind the guise of a restaurant, the ever so popular "speakeasy" was a place where one could imbibe in their favorite alcoholic beverage while enjoying the posh atmosphere, live entertainment, and elegant food. Vernon's Hidden Valley Steakhouse, "thus far one of the best kept secrets in Los Ranchos and the Albuquerque area," according to Gil Garduno local restaurant critic, brings back the appeal and ambiance of the long gone speakeasy in new world splendor. Unassuming and hidden behind a large black wooden door in the a corner of the Village Shops in Los Ranchos, under a red light (only illuminated when open), Vernon's boasts a cozy and intimate dining area with slick black diamond plaster walls, rich red planked ceilings. Vernon's Black Diamond Lounge, in the heart of the North Valley is the premier venue for live music in Los Ranchos. The Black Diamond Lounge is home to the area's most popular acts, new discoveries and special surprise visits from touring national acts. With it's sparkling black diamond walls and red velvet curtains, we will lure you into a lovely den of artisan cocktails, savory appetizers, intoxicating music and an egalitarian entry fee to boot. Vernon's has won numerous awards including "Best Steakhouse in Albuquerque" by Albuquerque the Magazine and Local IQ, Best Overall Restaurant, Best Food, Best Service, Best Place for a Special Occasion, Most Booked, Best Ambiance, and Most Romantic by Opentable.com. Vernon's Hidden Valley Steakhouse was selected by AOL's When.com Web site as one of "Twenty Romantic Restaurants We Love Across the Country." In 2011 & 2012 Vernon's Hidden Valley Steaks was chosen by Open Table Diners as one of the "50 Most Romantic Restaurants in the Country" out of more than 7 million reviews and more that 12,000 restaurants nationwide. In January 2012 Vernon's was chosen as "One of America's 10 Most Secret Restaurants" by The Daily Meal, January 2012. Visit Vernon's Hidden Valley Steakhouse at 6855 Fourth Street NW, call (505) 341-0831, or online at www.thehiddensteakhouse.com. 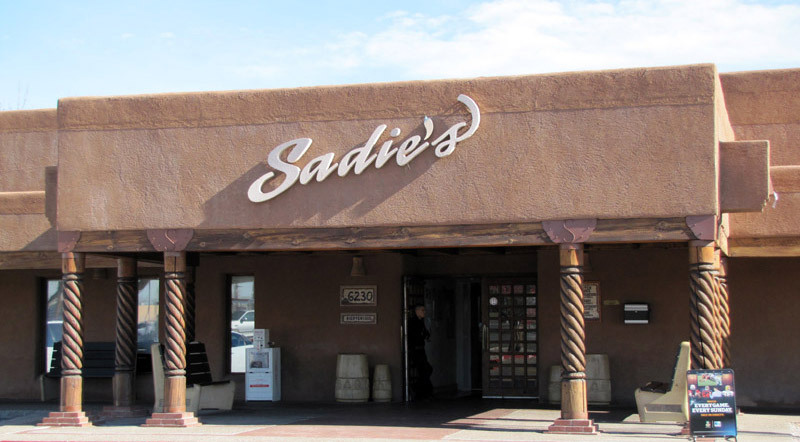 For over 50 years, Sadie's of New Mexico has been the area's number one source for authentic and delicious New Mexican cuisine. Visitors come from miles around (and from around the world) to sample the true taste of New Mexico at Sadie's. Using only the freshest ingredients and family recipes that have been passed down for generations, Sadie’s family-owned restaurant has grown from one woman’s passion for great food and service to a world-famous restaurant serving hundreds of people each day. Their salsas and chile are renowned for their bold kick and deep flavors , and lend themselves to thousands of recipes, old and new. From their enchiladas (the house speciality) to their legendary carne adovada, burritos and stuffed sopaipilla, you’re sure to savor the flavors at Sadie’s. Dine-in at 6230 Fourth Street NW, call (505) 345-5339, or visit them online at www.sadiesofnewmexico.com. The Benavidez family and employees at Casa de Benavidez offer excellent food in a delightful and peaceful atmosphere. Here you will find traditional Mexican and New Mexican food in the surroundings of a beautiful garden and waterfall. The full-service New Mexican restaurant also provides a smaller dining area for fast carryout meals complete with a patio. Once upon a time, about 50 years ago, newlyweds Paul and Rita Benavidez began to work on a dream. Since each had developed their love and skills of cooking at early ages, a family restaurant seemed to dominate the dream they shared. With little or no money in those early years, extra hard work and planning were in order. The original family restaurant, then known as El Mexicano, opened just about a mile away from the present location. The business began as a very small “carryout” with only three tables inside the modest structure. Paul, Rita, daughter Paula, and a newly hired dishwasher were full time employees with the three sons, Paul Jr., Mark and Glenn helping out in their free time. Time passed and the Benavidez El Mexicano was getting popular (thanks in part to their trademarked Sopaipilla Burger). This meant that they were getting busier. Paul was stockpiling used restaurant equipment in the foresight of expansion and his sons had quit their other jobs so they could focus on the restaurant full time. Still, they had outgrown the small building that began the realization of their dream. One day, as Paul was searching for a new location for their restaurant, he found an old corner house in what used to be known as the “Newlander Addition.” It was nearly one hundred years old and included a half finished waterfall to the south of the two story structure. The back area of the house would be perfect for their takeout business. When the deal was made, the Benavidez family moved out of their old location and into the new one in just one day! Rita had worries about having the carryout restaurant at the back of their house but soon those worries faded as business was once again growing strong. So strong, in fact, that the Benavidezes decided to open the full service restaurant in the front and let the carryout business continue as it had in back. This is when the family operated restaurant had its name changed to “Casa de Benavidez”. Their dream of serving traditional Mexican and New Mexican food in the surroundings of a beautiful garden and strolling musicians would eventually come true. The family and employees at Casa de Benavidez continue to offer excellent food in a delightful and peaceful atmosphere. Visit Casa de Benavidez at 8032 Fourth Street NW, call (505) 898-3311, or visit them online at www.casadebenavidez.com. If you are looking for authentic New Mexican food that always hits the spot, then you will want to try El Camino Dining Room. Everything you order will be completely homemade and the restaurant has an old Route 66 feel with plenty of family photos, vintage vending machines, and old road signs. Some of the locals enjoy their stuffed sopaipillas, huevos rancheros, green chile stew, and their chicharron burritos. Visit El Camino Dining Room at 6800 Fourth Street NW or call them at (505) 344-0448.